This eleven-round event concluded yesterday, with the two Suffolk players Justin Tan and Adam Taylor finishing on 8 points and 6½ points respectively. Justin, on his Facebook page, comments on his 'shaky start', which included a loss to his Australian compatriot IM Rishi Sardana. 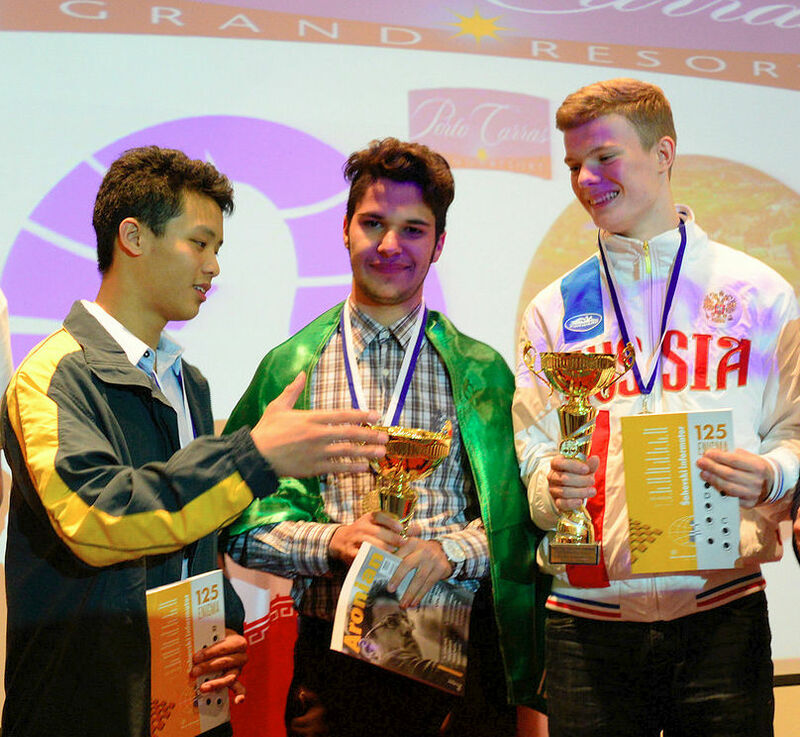 But he finished with a flourish, beating the only opponent with a higher rating, GM Alekseenko (2539) in the final round. Justin's rating will improve marginally to just over 2450. Seeded eight, he finished in joint fourth place (fifth on tie-break). Adam lost four games, all to higher-rated IMs. Three of these opponents also finished on 6½ points, the same score as Adam. He lost 11 rating points to 2281. His six wins tended to be against low-rated opponents. The final standings in the Open can be viewed here. The photo above shows Justin Tan (left) at the Closing Ceremony, about to shake hands with the winner of the Open, the untitled Iranian Masoud Mosadeghpour. Adam finished on 6.5/11 a great achievement. AnYthing over 50% at such a prestigious event is considered good. All games are tight and ratings here mean nothing, some of his opponents were TPR at much higher than their published grade, they are all hungry - they are all the future titled players. Adam was ranked 47th and finished 34th, he is also only U17 this year, he can play next year in the same event unlike some others. WYCC is known by all serious chess players to be a rating minefield and some juniors avoid playing here because of the risk to rating - not Adam, he is brave as are the other 23 England players who for the past 2 weeks had an experience to remember. No-one won medals but all improved; all learned lessons but mostly, they supported each other - invaluable for their future chess playing careers. Adam and Justin are at different points in their chess playing careers and to compare one against the other is, in my opinion wrong. Adam lost a few points, so what! He`ll get them back (prob this weekend) and more he has however learnt much - sometimes I wonder what these juniors have to do to be congratulated! Justin is of course to be congratulated for his medal, an excellent achievement as even though he was highly ranked medals are hard to get....but IMO not only medal winners should be praised. A similar stance to this was taken on the ecf forum and those responsible have been lambasted, indeed the Junior Director and others who matter in junior chess were far from impressed - they know how hard these kids work (as do I) and I for one am proud of Adam's achievement here as I am of my other 23 English kids! Thanks for your congrats to Justin - will pass them on (as I don't think he reads this blog!). I agree - 6.5/11 is a pretty decent result for Adam in this field - well done! And yes, in WYCC, ratings mean little. I wasn't attempting to compare Justin and Adam - just trying to provide a factual account. Adam is only 150 points or so behind Justin, and is a year younger. I'm sure Adam will follow in Justin's footsteps and perhaps obtain an IM title whilst still a junior. Apparently Australia have five u18 IMs, whilst England has none. Good to hear that is the case, my interpretation was somewhat different but happy to be proved wrong. Anyway, if, as a nation, we are looking for inspiration for Junior IMs/GMs we should look to countries who regard chess highly (e.g. Russia and India), and who consider chess a sport. In these countries, those who excel are intensively trained and importantly, Govt funded. These juniors often leave mainstream education early to focus on chess and by u18 level have had many many hours of coaching. In England, this is not the case - English juniors have to consistently try to juggle schoolwork with chess (alongside other interests and pastimes). GMs are respected and admired in these countries and often receive government 'pensions' whereas England often views chess as just a 'hobby'- the bottom line is it is very hard to make a living at chess in the UK so only the very dedicated continue the quest. Some of the juniors at WYCC had access to 1-2-1 coaching and often prepped for 4 hours plus a day before their game - this is beyond the reach of many of our parents. The short answer is, unless attitudes towards chess as a career change and junior funding is made more available, it is unrealistic to expect that our juniors could compete, the fact that some do so well is to be commended. I have no idea of the position in UK, so can only give a snapshot of our experience in Australia. Australia, like England, provides very little or no funding to juniors for chess (Justin got a £50 grant for WYCC). There is also the same lack of public recognition for GMs etc here. However, I think two factors have been influential here for the top juniors (we have 5 under-18 IMs and 5 FMs despite a much smaller population). First, chess has grown to be viewed by many parents as the equivalent of 'music lessons' - in other words, more than just a 'hobby' and more akin to a serious extra-curricular subject. So, as a result, there is a strong culture (in Melbourne anyway) of private coaching / tuition and a correspondingly growing industry of personal chess coaching. Of course, this requires huge financial and time commitment from parents, in exactly the same way music lessons do. Most of our top juniors have developed with regular personal coaching from a young age (and continue to do so). (plug: Justin is available for coaching around Ipswich ☺). Secondly, in Melbourne, chess has been driven by a number of serious clubs. Kids progress from school to one of these clubs, where they play weekly games against open opposition, with all games FIDE-rated. These clubs would generally have 2300-2400 rated players and have weekly attendances of about 30-50 players with prize money up for grabs (hence attracting IMs etc). So, many of the kids play at least one (sometimes two) FIDE-rated games per week on average against consistently stronger opposition – this has been invaluable in giving them competition experience from a very young age. These clubs also have a strong culture of club coaching for kids, which instill passion and provide a social environment. That said, the juniors here face a ceiling when they get to about 2300, because the opportunities to play GMs then become almost non-existent. The pool of players above 2400 is very small compared to the top-level strength in UK / Europe, where opportunities for norms are beyond what any junior in Australia can hope for – and needless to say, being in UK has been great for Justin’s chess post-2300. As I said, I don’t know the situation at all in England, so this is a purely personal account of our experience in Melbourne (we have 3 U-18 IMs and 3 U-18 FMs in Melbourne alone, so it may not even be representative of Australia as a whole).